One of the highlights of the recent Japan Matsuri was a performance by the talented NAOMI SUZUKI who drew a sizeable group of enthusiastic J-Pop fans and curious bystanders (and which featured a cosplay dance troupe including J-Pop Go/Marshmallow Llama Time star Finny Attridge!). Naomi has been carefully crafting a career over the years which has seen her occupy the roles of model, presenter, actress, producer, promoter and songwriter. Scoring a No. 12 hit in the UK Club Charts, Naomi has also starred alongside Hugh Grant in the film Bridget Jones Diary and has more recently formed the music duo AJ Unity alongside fellow musician Philipp Moll. This led to the release of the stylish and multi-genre album Sweet Roses which also features the talents of the late pianist Jun Fukamachi. One of the goals of AJ Unity is to raise funds and awareness of the Earthquake Tsunami tragedy which struck Japan in 2011. What are your thoughts on the Japan Matsuri? It’s one of the biggest Japanese events in the UK and includes traditional Japanese culture as well as new generation’s pop culture, cosplay – and J-Pop songs like I did, really a mixture of Japanese things. But I think it’s a really good opportunity to explain about Japanese culture in Europe. Did you enjoy your performance at the event? Yes I really did. I have been working for Japan Matsuri for 4 years, since the first established one 4 years ago, and I was MC since then every year. But I can see that the Matsuri has been growing and developing every year. My role, the first year, was acoustic pop singing, with violin and piano. It was really folk style. My style has been slightly changing for the Japan Matsuri and for this year I had the band and the cosplaying dancers. I could feel a really nice atmosphere between the audience and the stage. It was really, really good. Where you surprised by how big the crowds were for the Matsuri and also at your performance? Yes, huge. We said almost 70,000 people came. I think most of the audience were so nice to cheer us and be supportive. Obviously J-Pop is enjoying a larger global audience these days. Do you think J-Pop is going to get bigger here in the UK? I hope so! I really hope so, because I could feel the difference between 10 years ago and now. When I was singing J-Pop 10 years ago in this country people would look at me: “How strange this girl is, what is she talking about?”. They didn’t understand what I am doing and it was like I was an alien from another planet! (laughs). I could feel they didn’t enjoy it. It was just music from a different culture, that’s all. But now, I could feel they really enjoyed Japanese music, J-Pop, as well as traditional culture. They wanted to feel Japanese pop culture, that’s the difference. So in a few years time I think it’s going to be more built up. Do you think there is a big difference between the UK music scene and the Japanese music scene? I think there are big differences. It’s a totally different world. Because I have another band, AJ Unity, which is more Western style and I’m doing J-Pop, it’s a different world. But really the UK market and J-Pop market is different. I think expression is totally different. Can you tell me a little about how AJ Unity were formed? OK, AJ Unity – A is Austria and J is Japan. My music partner Phil Moll is from Austria, I’m from Japan. So we just made a unit for more like European music, chill-out and lounge, that sort of style, it’s different from J-Pop. I love to sing J-Pop, but I love to listen to chill-out. I thought I’d like to sing that kind of music if I can and Phil Moll had the skill and ability – using the computer, making music. We had the same taste, so I said to Philip “Let’s do it, let’s do it”. At the time I was organizing a Princess Diana exhibition in Japan. It was quite a huge success with photographs, the dress and exhibition of Princess Diana and I thought that kind of music could be theme songs for Princess Diana with elegance, beauty. That sort of atmosphere maybe could be suitable for a Princess Diana exhibition. So this was the concept to create several tracks for the exhibition. Then a US promoter listened to the music and he asked me “Why don’t you promote in the US?” and I thought, why not try? So we tried some US promotion and straight away it went to offshore radio chart No. 14. So I think this is a different way of J-Pop style but still – it works. What was the reaction like for the album Sweet Roses? I had a couple of interviews and reviews, which is quite nice. They really admire us because some of them said “This is the most beautiful sounds in the world!” so we are very proud of AJ Unity! What’s the story behind your new single Our Song ? It is produced by Andy Wright who produced Simply Red, David Bowie, Sinead O’Connor. I had a friend who worked for Simply Red, one of the musicians. Normally we would play pubs or somebody’s house in music together. That’s how I knew Andy. Now I am doing charity things for victims of Japanese tsunami last year because I wanted to really support them with my music. All the profits from the CD are sent for the victims. It’s not going to be huge money, but still all I could do is just selling CD, then if I have a little money to send for a donation. Also the music’s power is really strong to make people happy. I think the music is always helping people to be positive. So that’s why I wanted to use music to support victims of tsunami and earthquake last year in Japan. And I’d spoken to Andy about this concept and he was really happy to help me. Can you talk a little about your choice of songs for your performance at the Matsuri? The first song Home, I wrote last year for the tsunami victims. I wrote this song with victims because I wanted to sing how they feel. I didn’t want to sing “Let’s Do it! You can do it! Cheer up! Let’s go!” you know, because they are doing their best already. So I wanted to use the victim’s words, how they feel. That’s why I asked one of the victims: “Please help my lyrics and could you please give me what you feel about the earthquake”. He wrote some notes, then I changed it into my lyrics. Also, there is a song called Mother . This is also a charity song for children who lost parents, because I really want to help children. Because they have a huge future but they don’t at the moment have families, they don’t have hope. So I really wanted to give them hope first of all, a dream. Because I don’t want them to be depressed all the time. So this is the song for them called Mother . The third song, called Robinson, is very famous pop music in Japan. The artist is called Spitz, one of the biggest stars in Japan and I thought “Everyone knows this song” so really suitable for Japan Matsuri. The cosplay dancers looked great. Who decided to have the dancers on stage? I did! (laughs) To sing anime songs I think the cosplay dancer can be suitable for anime things. What sort of artists have influenced you in your music? I have a lot of different musicians I’m influenced by. About ten years ago I was influenced by Mariah Carey, Whitney Houston, that sort of singer. But I realized this is different, this is really not for me. It was a really, really good exercise to sing and copy how they’re singing. This is really good practice for me, so I’m still singing for my practice, because they have a quite wide range – high and low – and expression is really deep, emotional. So if I copy them, how they’re singing, it’s really for my practice, it’s good. Yes it’s very different. I have to try all the techniques – even rock or opera or even classical. This is different from what I want to do or what I have to do. So if I want to build my technique I think I need to practice all the types of music. This is why I have been influenced by all different types of music, like Janis Joplin, Sarah Brightman, that sort of style. But when I am really natural I am totally influenced by Japanese folk music. You’ve just released Our Song , are you working on new recordings at the moment? Yes I am. This is a collaboration with AJ Unity and a Japanese pop singer we’re doing together and this is also supporting children. Smooth and more like warm song. We’re just recording at the moment. Is there a timescale for that release? Going to record vocal next month and then I think releasing early next year or end of this year. You’ve worked with more than a few respected and well-known producers and musicians in the past, do you have any particular favourites? Yes, I worked with Brian Rollins who worked with Kylie Minogue and his way of business, his way of producing is really, how can I say, really Pop. He knows how to sell music and he knows how to create music and in this atmosphere when I’m singing, whatever I’m doing, I’m so comfortable to work with him. So I’m really impressed with his way of producing. What was it like working with Jun Fukamachi? He died 2 years ago when AJ Unity’s Jupiter was first released in the UK. That was the same day. He played piano for Jupiter. He was a very famous pianist in Japan. He is kind of, what’s the word, the boss. He brought all kinds of Western music to Japan. So introduced the world famous musician Steve Gadd, Brecker Brothers, he introduced that sort of ordinary jazz musician to Japan. This is why Japanese people are getting more about jazz and western music, because of him. I loved his piano because he had a really good technique, a really quick and amazing technique. But when he played with singers he never showed off his technique. He tried to breathe exactly same as singer. So when I breathed in – he breathed in. When I breathed out – he breathed out. This really made a good feeling, same vibrations. So he was the man who could make that kind of atmosphere. That’s why I really admired him. That’s why I asked him to play on Jupiter for AJ Unity and he said “OK I can do this!” and he played for us and we released the last two years ago in October and he died. Really, really sad. Of course Perfume are one of the Japanese bands that are well-known outside of Japan and that are embarking on a global career. I think so, yes. Because their music is really a new style and really acceptable for European people. That’s why I think they’ve opened the door. I think they’re certainly paving the way. What are your thoughts on Idol groups, such as Morning Musume and AKB48? (laughs) They are cute, they are nice. I think for girls, for women, I don’t feel excitement of their costume, but I think for men, maybe touch their heart “Oh, so cute!” (laughs). I think their style is using school costume and more exaggerated. 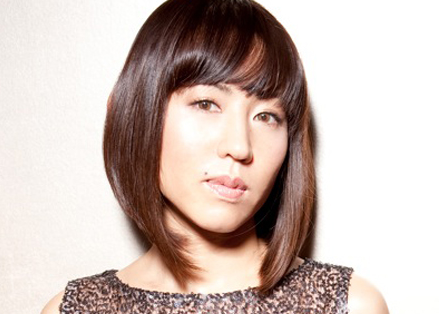 J-Pop Go gives its warmest thanks to Naomi Suzuki. Naomi Suzuki has released Our Song which is available from iTunes and Amazon and select outlets (including JP Books in Mitsukoshi). Also available is charity CD Mother which supports children affected by the 2011 Earthquake Tsunami disaster in Japan.